Denny Jump (Bellevue, WA, United States) on 2 March 2012 in Landscape & Rural. Great capture, wonderful tones and those reflections are great. @Richard: Thank you so much Riochard ;-) My best to you both - I hope all is well, and have a great weekend! Lovely scene Denny - is it level? All has turned to gold, here ! The water surface with the reflections is a pure splendour ! @Gérard Beullac: Hi Gerard - Thank you very much sir. Have a wonderful weekend! @Julie L. Brown: But soon I hope ;-) Thanks Julie..Sign me up for your next trp to Olympic Peninsula! @Eric Cousineau: Many thanks Eric! Always appreciated sir! @Doug: Yes it does, Thanks very much, Doug. I absolutely was stunned at your magnificent image today ..wow! Beautiful Denny. I love the burnished golden glow & the range of textures from top to bottom. Great shot sir. @Williams: I love this colour too, Paul. Thank you...I am lucky because we get to see this quite often here. beautiful Denny! It really does look like two images pieced together...awesome color and reflections! @Cheryl: Hi Cheryl - Thank you so much - yes it does doesn't it? That split between surface textures is a wonderful treat and trick for the eye, and this golden tone is superb. Fabulous view, it really looks like two images !!! 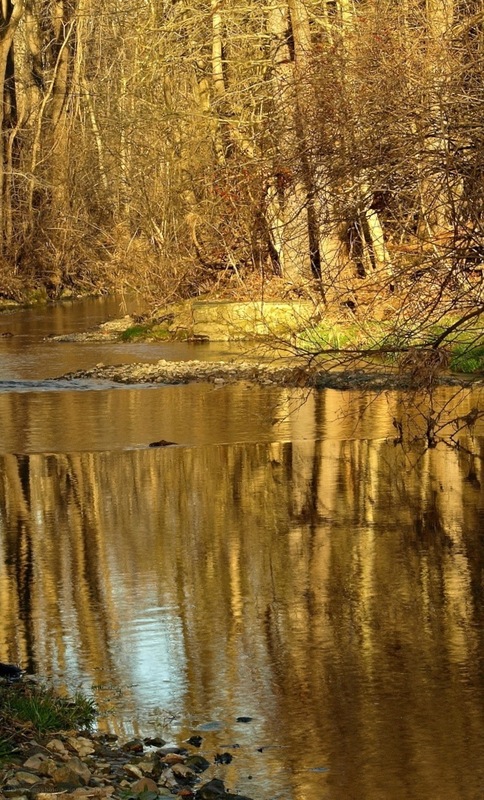 I like these ocher tones and the reflections..
Beautiful golden tones and reflections Denny. It does look like to images merged together. @Bill Brown: Thanks Bill..When the sun hits these trees back here, it really is quite beautiful. I dod not even notice this "split" until fiddling with the image at home on my iMac..really kind of cool but also confusing:-) And I need tp straighten this image just a bit..Nigel pointed it out ...Have a great weekend. @LauraS: Well, it's Friday - you deserve two shots...Thanks, Laura! Great height that you've given this composition to highlight the beautiful reflection! Incredible textures as well in the dense network of branches. Beautiful tones and reflection! Have a great weekend Denny! @Elaine Hancock: Thanks Elaine - Barbara and our daughter and her family are all due back here on Sunday evening - they have been spending the week in Florida...I have been driving the cat crazy . How well seen and I absolutely love your golden tones and reflections! Fantastic!! What a fascinating effect from something so simple . . but it is the 'gold' I see here . . gold, lovely gold ! Have a safe weekend, Denny. Gorgeous color and light and comp. Love it. @Steve Rice: Thanks so much, Steve - much appreciated! Delightful image, Denny - love the Impressionistic mood you get with these reflections. @Stephen: Thank you very much, Stephen! The colours and the reflections were wonderful that day ;-) All the best sir! Beautiful golden colors, reflection and scenery! Fantastic Denny! What a great place to soak up the sunshine, especially considering how rare it's become lately. The gold color is so inviting!